This weeks pattern comes as a request from the CCP crafters group. It is a very small and dainty jacket/cardi for 16-18 weeks. 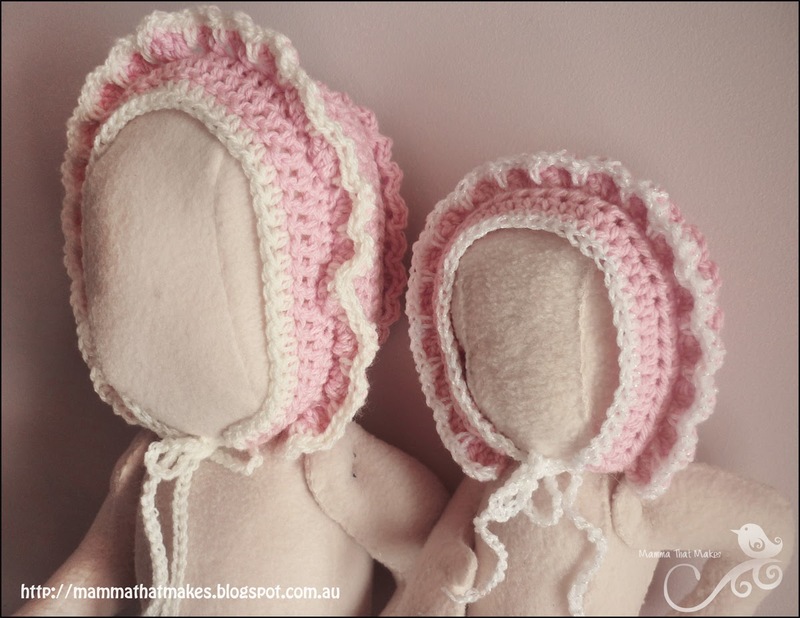 I will have a hat and booties up to match it in the future. I know bubba's of this size more often then not don't wear clothing and instead use wraps/cocoons ect, but it is incredibly important that there IS clothing options available for those who do need them, and as it stands now, there is such a lack of items to fit the 16-20 week range. Hopefully I can bridge that gap some with a few items for people to make and donate. End off and weave in tails. End off and weave in ends. Repeat 1-6 for second sleeve. Add a button and weave in all ends and you are done! Haak 1 half stokje in de 2e losse vanaf je haaknaald en elke overige losse. (30) Haak 2 lossen en keer je werk. *Haak 2 stokjes in de 1e steek, 1 stokje in de volgende steek*, herhaal tussen *-* tot het einde (45) Haak 2 lossen en keer je werk. * Haak 2 halve stokjes in de 1e steek, half 1 stokje in volgende 2 steken* herhaal tussen *-*tot het einde (60) Haak 2 lossen en keer je werk. Haak 1 stokje in de eerste 13 steken, haak 5 lossen, sla 8 steken over, haak 1 stokje in de volgende 18 steken, haak 5 lossen, sla 8 steken over, haak 1 stokje in de laatste 13 steken (44 stokjes, 10 lossen) Haak 2 lossen en keer je werk. Haak 1 stokje in elke steek (ook 1 stokje in de 10 losse uit rij 4) (54) Haak 2 lossen en keer je werk. Haak in elke steek 1 stokje, kant je werk af en werk de draadjes weg. Hecht je garen aan in 1 van de losse steken bij het armsgat (het mooist is aan de onderkant), haak 2 lossen, maak 19 stokjes verdeeld rond het armsgat, haak vast met een halve vaste in de beginlosse (19) Haak 2 lossen en keer je werk. Haak 1 stokje in elke steek, haak vast met een halve vaste in de beginlosse (19) Haak 2 lossen en keer je werk. Haak 2 stokjes samen, haak 1 stokje in de resterende 17 steken, haak vast met halve vaste (18) Haak 2 lossen en keer je werk. Haak 1 stokje in elke steek, haak vast met halve vaste (18) Haak 2 lossen en keer je werk. Kant je werk af en werk draadjes weg. Herhaal rij 1-6 voor 2e mouw. Naai een mooi klein knoopje op het vestje en klaar is je vestje. Today's pattern is for a very small diaper. This month our CCP crafters group have been working on diapers, pants and keepsakes, and one of the challenges we had was finding a range of diaper patterns in multiple sizes, especially the very small. So of course, I set out to rectify that. This diaper fits on my 16 week doll quite snugly. I know sometimes not all babies of this size would actually be able to wear such an item, but it is comforting to know that the option is there should someone need it. They are very quick to whip up. I'll have some more diaper patterns over the coming weeks. 1 safety pin for securing, or ribbon or a small button. 1: ch32, hdc in the second chain from hook and in the 29 chains, 3hdc in the last chain, do not turn, instead working on the opposite side of the chains you just used, hdc in each of the next 29 chains, 2hdc in the last chain and join. 17: ch1, but do not turn, sc evenly around the entire diaper, being sure to do 3 sc's in the corners, join when you get back to the ch1. Weave in ends. If you want to use a tie closure, weave it evenly in and out of the stitches in the middle of the waist band. 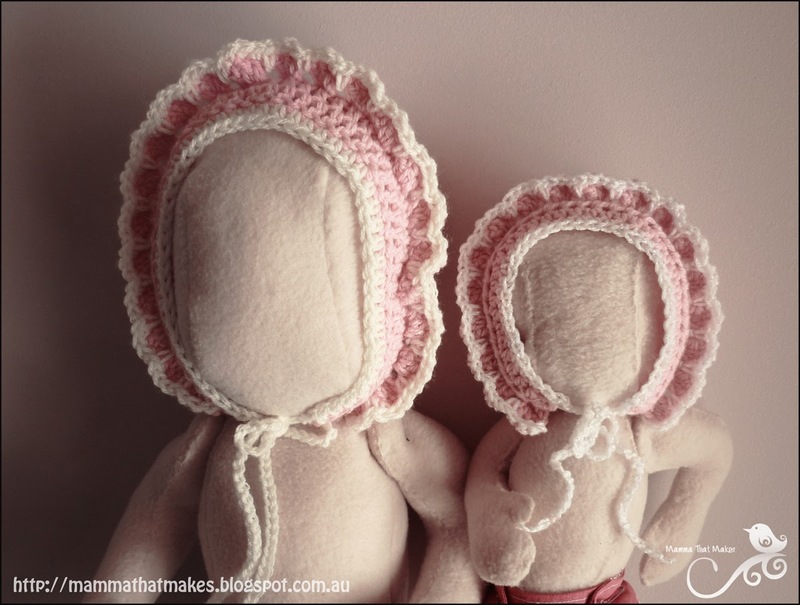 Today I have a new free pattern for you all. Meet George. George is a snowman, and a cute one at that! He likes ginger cookies and peppermint bark and his friends (who we will meet soon enough!) Just in time for some last minute Christmas Crochet! Arr who said this year could go so fast? George is made in one piece, meaning no joining his head to his body, HORRAH! He is also worked in the round, so no need to join at the end of each round, just move your marker.George is about 6.5 inches tall from base to the top of his pompom making him a perfect shelf sitter or stocking stuffer. Want to make a George of your own? Or perhaps a whole tribe of them! Here is how! Attach eyes to desired place and start stuffing head. End off leaving a long tail. Use the tail to weave in and out of the remaining stitches and gather closed. 1: ch2, sc 5 times in the first stitch, join. 2: sc in each stitch around, join. End off and leave a long tail to sew onto George's head. 1: ch2, hdc into the 1st chain 5 times, join. 2: ch2, *2hdc in the first stitch, hdc in the next stitch*, repeat around, join. 3: ch2, *2hdc in the first stitch, hdc in the next stitch*, repeat around, join. 4: ch2, hdc in each stitch around, join. 5: ch2, 2hdc in each stitch around, join. 6: ch2, *2hdc in the next stitch, hdc in the next stitch*, repeat around, join. 7: ch2, hdc in each stitch around, join. 8: ch1, sc in each stitch around. End off, leaving a long tail to sew hat to George's head. 1: ch52, sc in the second chain from hook and each chain across. 2: ch1, sc in each stitch across, when you get to the end, sc3 times in the end, then working on the other side of the green stitches, sc across until you get to the other end, 3sc in that end as well, and then sc in all stitches back to where you started, join. End off and weave in tails. Tie scarf around George's neck. You can choose to sew it in place if you like. Good morning lovlies! 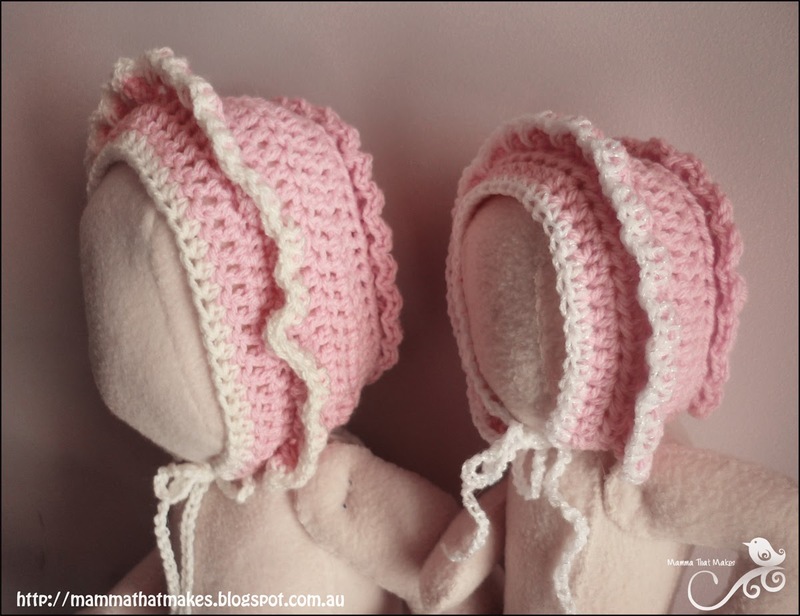 This weeks pattern is for a fancy little bonnet. It may look a little complicated but it is a super easy pattern and Im sure even beginners will be able to attempt this beauty. It comes in 2 sizes, prem 24-26 weeks gestation, and Newborn (full term) I have only tried this with a variety of pinks and whites so far but I bet it will look amazing in all sorts of fantastic colour combinations. 3: ch3, *2dc in the first stitch, dc in the next stitch*, repeat around, join. 4: ch3, *2dc in the first stitch, dc in the next 2 stitches*, repeat around, do not join. 5: ch2, turn, hdc in the front loops only of each stitch around. 6-8: ch3, turn, dc in each stitch around. 11: sc evenly around the neck line of the bonnet. End off yarn. Hold bonnet so the front is facing you, and the rear is pointing away. Join yarn to an unworked loop on the left side of round 5 with a sl st. sc into the same stitch. *hdc 3 times in the next loop, sl st into the next loop* repeat across, sc into the last back loop. End off. Join your yarn in the same manner to the unworked loop from round 9 and sc in the same stitch, *dc 3 times in the next loop, sl st into the next loop* repeat around, sc in the last loop. End off. 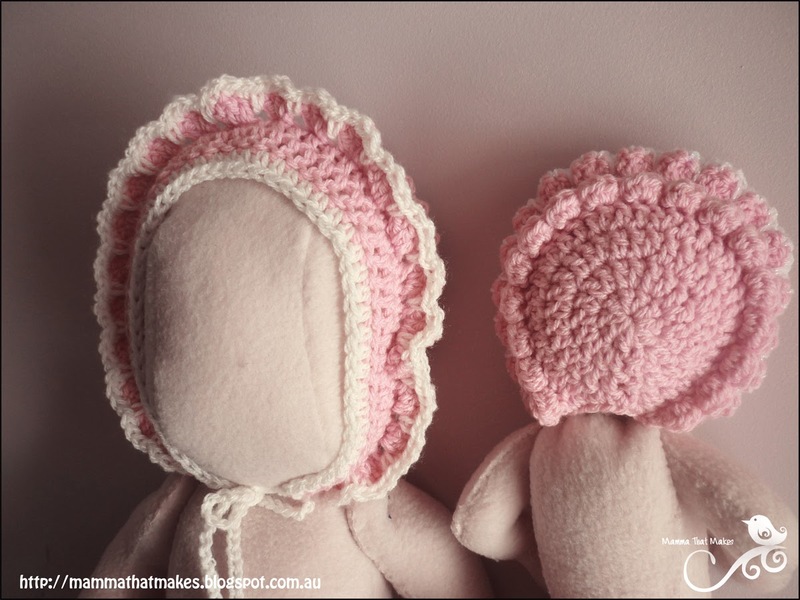 With your contrasting colour, join the yarn to the first sc on the front ruffles. *Sc into each of the 3 dc's, sc over the top of the sl st (there will be a gap below each sl st from the previous row, use that to complete the sc)* repeat across, sc in the last sc. End off. With contrasting colour, chain 40, join yarn to a corner of round 10 and sc in each stitch across until you get to the second last stitch, ch1, sl st into the last stitch, chain 40 and end off. 6-9: ch3, turn, dc in each stitch around. 12: sc evenly around the neck line of the bonnet. End off yarn. oin your yarn in the same manner to the unworked loop from round 9 and sc in the same stitch, *dc 4 times in the next loop, sl st into the next loop* repeat around, sc in the last loop. End off. With contrasting colour, chain 45, join yarn to a corner of round 10 and sc in each stitch across until you get to the second last stitch, ch1, sl st into the last stitch, chain 40 and end off.